An exhibition highlighting traditional trade villages opened at Kim Ngan temple in Hang Bac street, Hoan Kiem district of Hanoi on October 9 with an aim to promote values of heritage and honour artisans who contribute to preserving the values. Visitors to the event, part of the activities to celebrate the capital city’s 64th liberation anniversary (October 10, 1954-2018), were introduced to various traditional jewellery crafts in the city as well as in Hai Duong, Bac Ninh and Thai Binh provinces. The exhibition displays a large number of traditional craft products showing the talents and enthusiasm of Hanoi artisans. The process of making the products is also performed. Visitors also have a chance to meet and talk with artisans from trade villages to get a deeper understanding on the tradition and quintessence of the crafts. 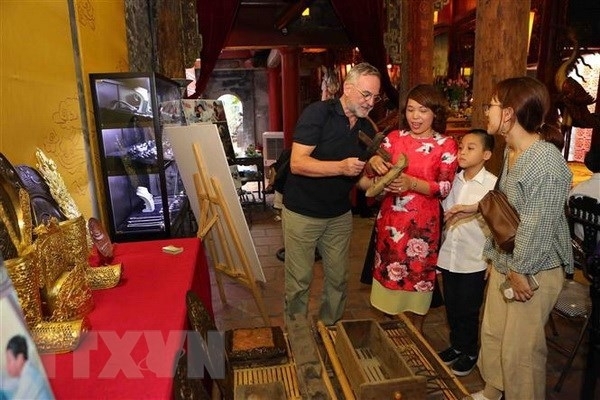 Tran Thuy Lan, Vice Director of the Hanoi Old Quarter Management Board, said the organizers hope that Kim Ngan temple will become a venue for artisans to meet and exchange experience, thus attracting more visitors to Hanoi old quarters and promoting craft villages in Hanoi. A fashion show themed “Hanoi’s Autumn” and music performance will be held in Phung Hung street on October 13, introducing collections from various designers such as Trinh Fashion, Adesigner, Thao Oliver, Camelia Fashion, Myana, D.Khang, Caroll Tran, Yen Phu Designer, A&C Media and Azalea. Visitors can get free make-up, hair dressing and try the clothes introduced in the fashion show. 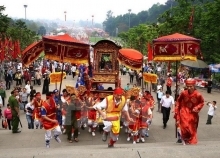 The Hanoi Old Quarter Management Board also plans various activities such as folk music performance, folk games in the street to make Phung Hung a tourist attraction and a hub for public art activities.